Allow Time To Set Up And Test -- If you plan to use BlueJeans to moderate or participate in an upcoming meeting, be sure to login and familiarize yourself with your account well in advance (at least one week prior). The best way to review is create or launch a test meeting to ensure that everything is working. By testing BlueJeans in advance, you will have hands-on knowledge of the system prior to your meeting. If you have questions or concerns as you review, contact the IT Division Help Desk . If given two weeks’ notice, we can schedule time to give hands-on tutorials of BlueJeans. Please email helpdesk@jlab.org  for more information. BlueJeans videoconferencing system provides multimedia collaboration and videoconferencing to Jefferson Lab (JLab) staff and users using your JLab CUE  username and password. 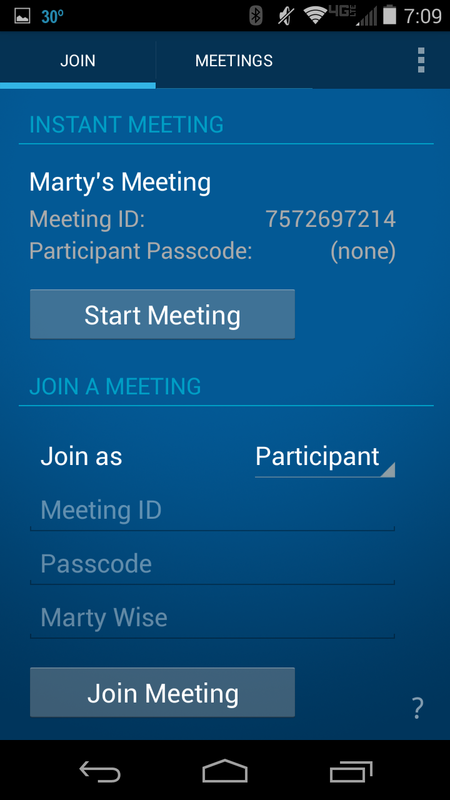 You can start your own meeting or attend meetings hosted by others. Non-JLab users can be given connection information so they can attend and participate in established meetings. The system supports any combination of chat, video and audio and also supports media and desktop/application sharing. All this is available from virtually any device -- H.323 "room" systems like Polycom, as well as Windows, Mac and Linux desktops, laptops and tablets using a web-based system. Even mobile phones and tablets running iOS (iPhone/iPad) or Android are supported through freely downloadable apps. Moderator – The host of the meeting. They schedule the meeting from their BlueJeans account, send out the invitations, and start the meeting. Participant – A person invited to a BlueJeans meeting. An invitation is sent to participant email addresses specified by the Moderator when the meeting is created. All meeting information is included in this email. My Meeting ID – A number associated with each BlueJeans meeting. This can be set to a default number or is auto generated by BlueJeans. The Meeting ID will be shared with Participants via the invitation email. 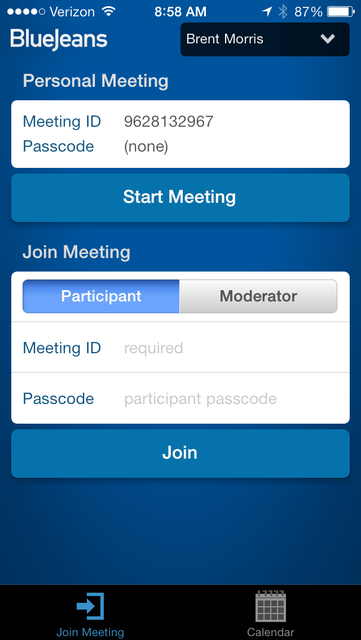 Moderator Passcode – A password used by the Moderator to start a BlueJeans meeting. The first time you login to BlueJeans you will see an initial page that prompts you for your name and other user preferences. We recommend you follow the configuration steps below to update your preferences with your Jefferson Lab contact information. In particular, we recommend changing your ‘My Meeting ID’ to your JLab phone number for an easy to remember ID. NOTE: If the number is already taken, you will receive a 'Meeting ID already taken' message. NOTE: You are responsible for remembering your Moderator Passcode. NOTE: This may take up to 10 minutes to propagate. There are many other preferences you can personalize with your JLab BlueJeans account. Please review the rest of the preferences. If you have questions, please contact the IT Division Help Desk  or BlueJeans support . 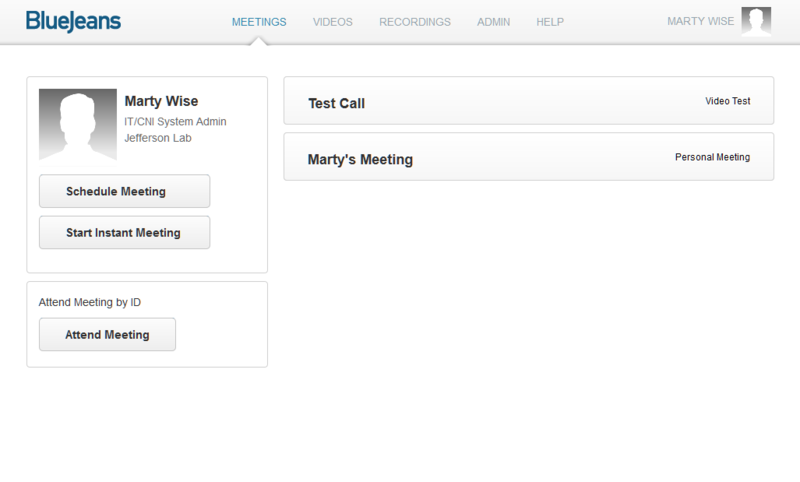 For a BlueJeans audio meeting, joining is simple and easy. IMPORTANT: For the best audio quality in your office or conference room, we recommend using the speakerphone feature on the telephone installed in the room. The only conference room with a built-in sound system is CEBAF Center F113 and the CEBAF Center Auditorium. In order to moderate or participate in a video and audio meeting, you must have a webcam. Most conference rooms have a webcam installed. If you need to borrow a webcam, please contact the IT Division Help Desk  for a reservation. For detailed tutorials, documentation, and videos from the vendor, please scroll to the bottom of this page for links to the appropriate BlueJeans webpage. Below please find terminology used throughout BlueJeans. NOTE: Clicking on the screen shot icons will bring up a larger image. These screen shots were collected on a Windows 8.1 Desktop System running IE 11, an Android 4.4 (KitKat) system running Chrome, and some version of iPad or iPhone (not sure what device/version). There may be slight variations if you are using a different platform. To login to BlueJeans from a web browser on a Windows, Linux or Mac system, just navigate to http://jlab.bluejeans.com . This page is easily remembered and bookmarked and can be shared with others you wish to meet with. This is the custom "landing page" for Jefferson Lab. On the left of the page is a button labeled "Login". Click "Login" to login. 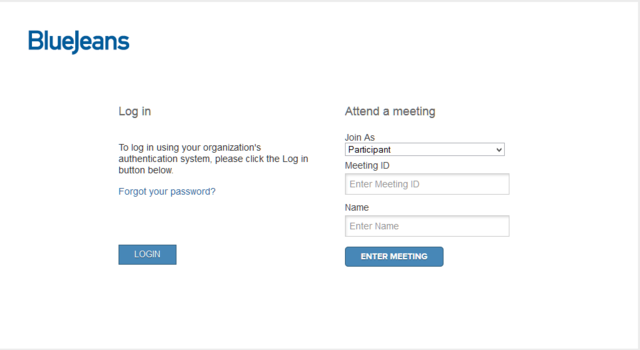 Outside users you wish to meet with can use the right-hand portion of the page to enter connection parameters you provide them with in order to connect to your meeting. Logging in Using the Android App -- YOU MUST FIRST LOGIN USING A WEB BROWSER (ABOVE) TO SET UP YOUR ACCOUNT. Review the permissions necessary and accept the installation of the app if you approve. You should review the permissions granted to all apps you install. BJN needs access to several resources on your phone to operate. 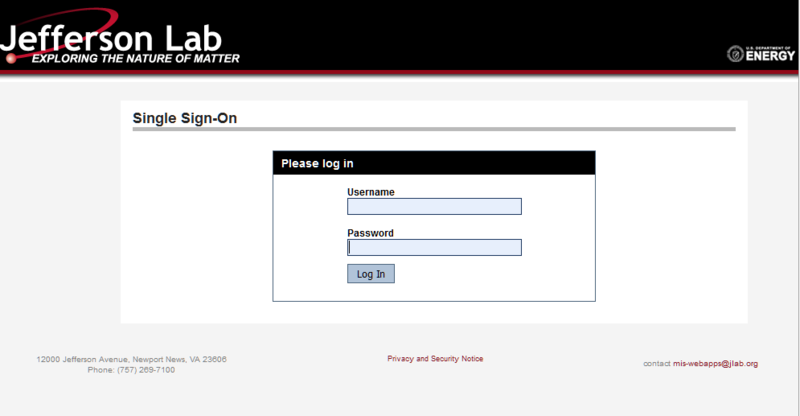 Note: NEVER enter your JLab login credentials into a web page that is not an official JLab page. Using the iOS (iPhone / IPad) App-- YOU MUST FIRST LOGIN USING A WEB BROWSER (ABOVE) TO SET UP YOUR ACCOUNT. To ensure a consistent, reliable, and first-class Primetime experience, event moderators and presenters will be required to join through the BlueJeans App after 9/10. Attendees can still join through preferred browser options. Over time, browser plugins have proven to be more insecure than browsers themselves. Consequently, browsers such as Firefox, Internet Explorer, and Chrome are phasing out plugins. Instead, features historically offered through plugins are now being introduced in the form of built-in browser features. 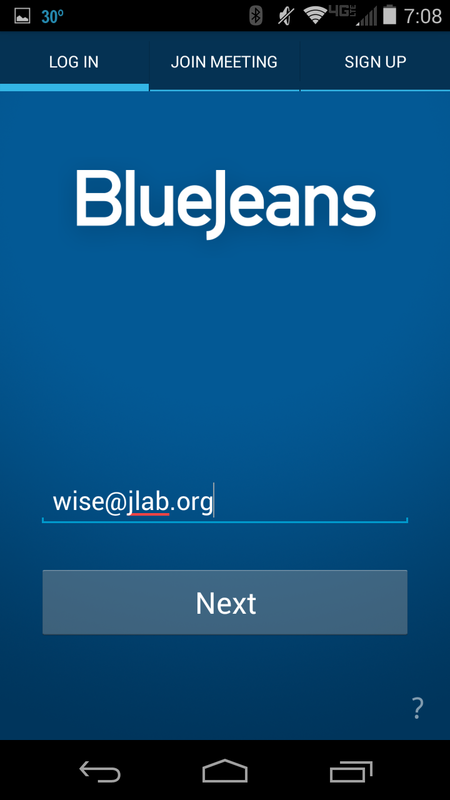 For a full list of BlueJeans App downloads, please visit the BlueJeans Download Our App  webpage. Once you have the BlueJeans App installed, please select the 'SIGN INTO MY ACCOUNT' option. 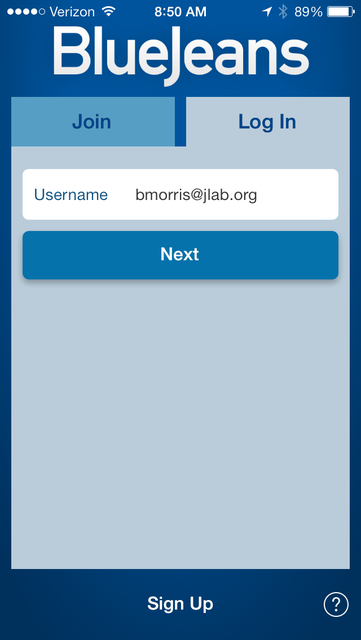 This should forward you to the MIS Portal webpage where you would use your JLab username and password to start the BlueJeans App. If you have any questions or concerns regarding this change, please contact the IT Division Help Desk . UPDATE: If you missed this training session, please watch the BlueJeans User Training  slide show presentation. The new BlueJeans  Videoconferencing system provides multimedia collaboration and videoconferencing to Jefferson Lab staff and users. The IT Division will host a BlueJeans training session on Friday, March 28, 2014 from 11AM to 12 PM in F113. BlueJeans staff will conduct the training remotely. There's no need to create a BlueJeans account, because IT has done the work for you. 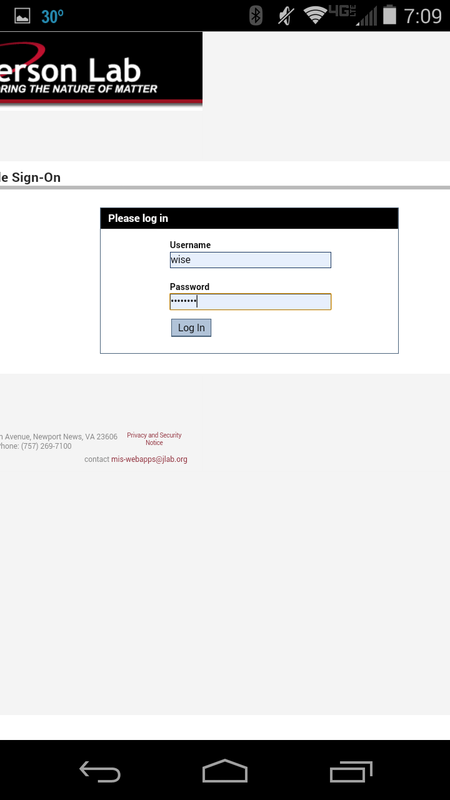 To log in, visit the Jefferson Lab BlueJeans  site, and use the 'Login' button with your Jefferson Lab username and password. For tips and tricks on using BlueJeans from anywhere, visit the Jefferson Lab BlueJeans webpage. Have a look around and bring questions to the training session. If you have any questions about this announcement, contact the IT Division Help Desk .